Good news, I saved a bundle with Geico. That's what I'm hoping I'll be able to say in about six months. If you haven't been keeping up with the news, the state has been working on a plan to switch to a competitive auto insurance as opposed to being fixed by the state (which it has been for the past 30 years). This is huge news, so huge it was on the front cover of the Globe today. According to the article, auto rates will be cut on average of 7.7% New rates go into effect April 1st of next year. 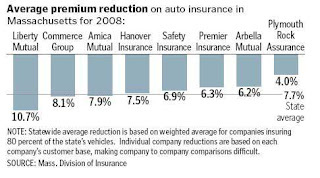 See below for average premium reductions by company. Not everyone is going to get a decrease though. If you're a terrible driver (or just an unlucky driver) and you have lots of tickets/accidents. Your rates will probably go up. Rates are locked in by next Tuesday, so it may be worthwhile to call your insurance company after the holidays to see what's going to happen to your rates. Also, the article states that no new insurance companies have entered the mix yet, so my lil statement about Geico earlier may hafta wait a bit longer. Click (here) if you'd like to read the article. Dear Warren Buffett, if you're reading this, please tell Geico to come to Massachusetts sooner rather than later. Thanks. 2 Response to "Car Insurance Prices To Decline"
Thanks for pushing the burden of insuring the worst drivers onto a smaller portion of the population! Can you explain how deregulation of insurance pricing would make your rate go up if you're a good driver? I assume that good drivers would be rewarded with lower rates, whereas bad drivers would have their rates increased higher beyond what the government would normally have allowed.